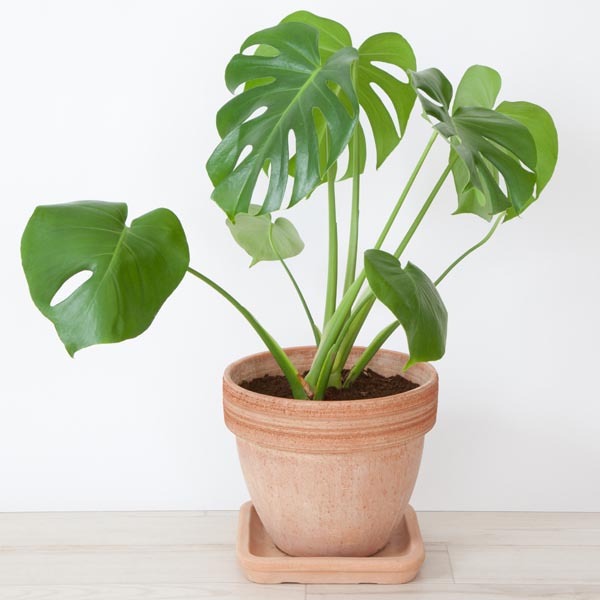 Although Monstera is technically not a Philodendron, it shares the same easy-care features. The deeply cut foliage has an artistic, sculptural appeal that adds a decorator-touch to any room. Monstera is native to the tropical rainforests of Central and South America where it climbs by aerial roots into the trees. In a container it requires some type of support, such as a trellis or fiber totem. Ultimate height will depend on the size of the support provided. A spectacular potted plant for large indoor spaces with bright windows. Can also be grown outdoors in a patio planter during the summer and brought indoors for the winter. Water every 5 to 7 days depending on light and temperature. Keep soil evenly moist, but not soggy. Plant in organic-rich, well-drained soil. Keep soil moist during periods of active growth. Apply a balanced liquid fertilizer monthly. Dust leaves occasionally to keep plant looking its best. Prune to maintain desired size.